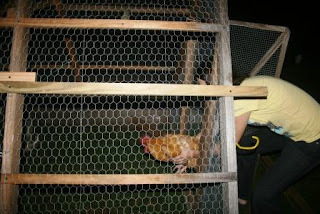 As I have blogged before, our chickens are free range, but spend the night in a chicken tractor to protect them from coyotes and the like. The chicken tractor is just a basic chicken coop that can move around the yard, allowing the chickens fresh ground each day. Paul has been in the process of winterizing the chicken tractor, and during that process decided to move the entire thing more than just a few feet - but a good bit all the up a hill and across the yard. Now this wouldn't be that big of a deal, but let's face it. Chickens aren't exactly the brightest birds on the block. Well, they couldn't figure out how to go to sleep in their home after it had been moved. Instead, they rambled around in circles in the dusk, right where their chicken coop had been last. This meant we had to round up the chickens ourselves. Paul got the easiest two - Priscilla and Elvis. He said we'd have to get the others together. But I didn't think it would be so hard. After all, they can't see all that well in the dusk. I figured if I got their leader, it would really confuse them and make catching the others easier. So I set off to catch Crockett. There are some mean old roosters in the world, but luckily Crockett isn't one of them. He's a little on the nervous side, and he still has that weak crow thing going on. But at least he isn't territorial. The key to catching a chicken is to move smoothly and confidently. And do so quickly. They really aren't hard to catch. At least ours aren't. It didn't take me long to pin Crockett down. 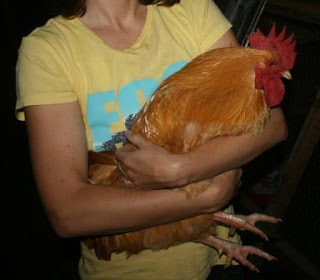 Have you hugged your rooster today? Off he went into the chicken tractor. After that, I rounded up the hens in similar manner, one by one. Horace was the last one to let me catch her. But even she didn't take much effort. Hopefully they will figure out how to get to bed on their own now. Unfortunately for us, we realized the error of our way at 4:45 am the next morning, when Crockett started crowing right under our open bedroom window. I'm linking up with WV Treasures' Show and Tail today. Go HERE to participate! Great post, but NOT a great LOCATION for that tractor! heeheehee!!! Love that rooster - what a beauty! That is funny! I never thought about it being hard for them to find their house if you move it! That is one big rooster! How many chickens to you have in all? My neighbor lets her in and out of their pen area. I've seen some of them roost in the trees around her house too! lol That is funny to see white chickens up in a tree when you drive by. That's funny. Sorry you didn't get enough sleep though. Those poor chickens are going to have to be confused some more. lol! That is too funny! Good thing he only has a weak crow! Hope the next time you relocate it that you won't have to round them all up again. I love this story - some people lead such an interesting life - ah. Fun. You do need to move the tractor! thanks for your comment! this post makes me laugh. My inlaws raise chickens, turkeys, geese and sometimes ducks...they still live in Romania (you can go back in my blog and see pictures from may 2008) anyway...she has 'punk' chickens...the hairdo like some other your other posts...she has some crazy stories to tell about her chickens too...and roosters for that matter! I hope they don't wake you up too early anymore. We have an Orpington rooster like yours and he is territorial and difficult to catch. At times I wear welding gloves because his beak and spurs are sharp... What made him overly territorial I think was a Bald Eagle attack he had to fight off of a hen.